A couple years ago I taught myself to sew. I’d always found sewing machines to be unforgiving, dangerous beasts. I decided to get over my sewing hangup because I had some ideas I wanted to bring to life, cute dresses mostly. I learned that clothing is consistent in the way it is put together. Patterns are modular, composed of the same basic pieces that can be tweaked for the wearer. There are infinite ways to combine fabric and pattern modules to make new design. Custom clothing is tailored to fit an individual, but always starts with the basic pattern shapes and modules. I learned that each machine, fabric and seam type has its quirks and that planning is key. I also saw how the hands-on experience of sewing influences fashion and cultural norms of body type. Cutting and sewing curved seams and shapes is complicated, time consuming and wasteful. Simple, straight-seam styles waste less fabric and time, leading the fashion industry to idealize razor-sharp thighs. 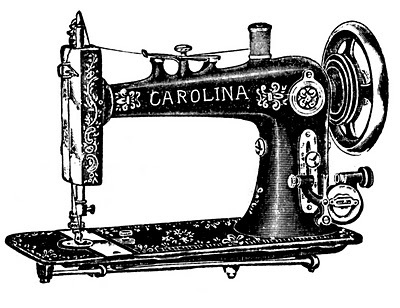 Sewing taught me to know and function in harmony with a machine, anticipating problems and learning personality tics of a few dozen vintage sewing machines I hunted, disassembled, reconditioned and used. When my house fan broke, I climbed into the attic to discover the fan engine resembled a huge sewing machine and I could fix it myself. I am pleased to think my desire for cute dresses gave me the confidence to repair my own machinery. Sewing also taught me to cultivate patience. I made mistakes that might have caused a younger me to put the machine in the closet and head to the mall. I learned to spot and manage the signs of frustration, to know when to change tasks to prevent error-causing fatigue. Seam rippers are tools used to take a garment apart, gently teasing an errant thread from the fabric. Seam rippers work to fix mistakes, but it’s far better to plan in advance and build with care. The law works in customizable modules like sewing, reflecting the repeated patterns of human interaction. The law has core models, modules and patterns that vary based on the needs of a given government and population. For example, in most common law jurisdictions, legal patterns begin with the modules of contracts, the law of voluntary obligation, torts, the law of involuntary obligation, and property, the law of “stuff.” Contracts, torts and property combine to cover the complexity of human experience. These patterns become ever clearer as I learn to create legally enforceable smart contracts. The smart contracts learning process reminds me of learning to sew. At first, learning to code seemed a monumental task fraught with frustration, but with patience, practice and learning about the machine, it’s coming along. Like sewing and the practice of law, coding is a complementary package of skills. I’m learning to recognize the patterns and modules involved in building a computer program so I can understand how those patterns may be changed to suit client needs, integrating with the patterns of law to create new, useful smart contracts solutions. As in sewing, frustration management through task variation is critical. Planning and patience are preferable to the seam ripper, but sometimes I just have to start all over again, a little bit smarter with each try. Learning curves have a pattern too.